Hunting party in the dunes, n.d.
Oil on canvas, 61 x 79 cm. On the edge of a forest, a dead oak towers over a fallen tree trunk while a barren dune landscape fans out in the background. A falconer, two hunters on foot and a traveller are walking along a road. 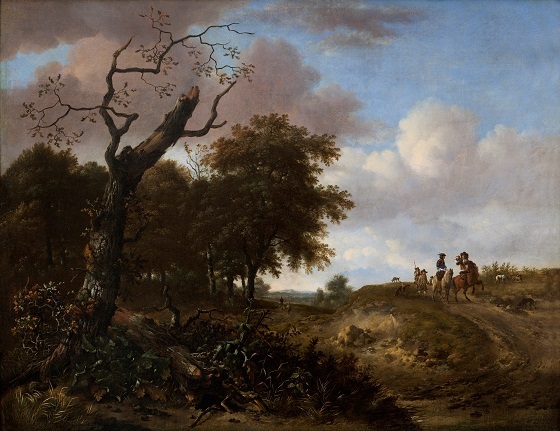 The rustic landscape that characterised the Dutch dunes and forests outside Haarlem became a favourite subject for many Dutch artists, including the landscape painter Jan Wijnants. Frailty and transience are recurring themes in the artist’s landscape paintings. Both he and Jacob van Ruisdael shared an interest in depicting the decay of nature in all its forms. This is seen in his dune landscape paintings, where dead or decaying trees often assume a prominent position in the composition.